a new home: Omaha, Nebraska, the hard-scrabble settlement on the banks of the Muddy Mo, new home as the daughter of a SAC scientist and a Brookings cellist. Soon she found herself in the front row of the concert hall at Joslyn Art Museum, craning her neck to see the source of that mellow, sonorous timbre wafting over the heads of the shrieking string section: It was the French horn, as her teachers, Jack Bourdess and Jack Snider, explained, over the years revealing the intricacies of the gently tapering tube, wound into a circle many would describe as a labyrinth. A brass ensemble serenaded the young woman, then Helen Jean Jackson, as she skipped down the aisle of the Lutheran Student Center in Lincoln in 1967, calmly embraced by the imperious reporter and biographer, Steve Jordon, and led into a life of ease and pleasure. Add children Leland and Ingrid, then Jin and Brandon, respectively, and, finally, granddaughter Mabel (possessor of another French horn, of course). Together, the Jordons found their way to the stage: The Nebraska Wind Symphony in 1983, the Lord of Love Scandinavian Brass (since 1973), the Omaha Press Club Royal Festival Orchestra, the Prospect Hill Memorial Day Band, the Marching Red Alumni, the Horn Huskers and, lately, the rhythm section of Monkey Funk. Her spare time is occupied by graphic arts — NWS programs, posters, flyers, newsletters, invitations — and trips to the printer, as well as making movies. Logo designer, greeting card manufacturer, roster overseer, screamer for “The Phantom” — her NWS contributions are many and ongoing. Brian Lund grew up in Arlington, South Dakota. He began playing trombone in the summer before 5th grade. Brian credits his band director, Bob King, for being the first to inspire his life-long love of instrumental music. Brian graduated from Augustana College (now Augustana University) in Sioux Falls with a degree in music education and minor in math. Dr. Lee Lillehaug, band director, and Dr. Harry Krueger, brass choir director, were two more major influences in developing a passion for high-quality music performance. After a brief stint as a band and choral director, Brian returned to college to learn about computers and programming. He came to Omaha in 1979 after being recruited by Mutual of Omaha as a computer programmer. Brian enjoyed a long, interesting carrier as an Information Technology professional with Mutual of Omaha and ConAgra Foods and retired in 2016. 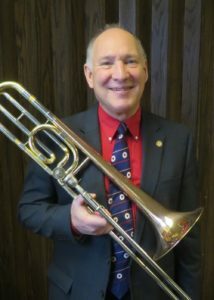 He spends his time as a member of three different boards of directors (NWS, Lord of Love Lutheran Church, and the Lutheran School of Theology at Chicago), being a Teammates mentor, leading the Lord of Love Brass that plays monthly for worship, donating platelets at the Red Cross, reading, gardening, golfing, and traveling. Brian married Deb, his high school sweetheart, in 1976. Deb is the administrator of Music in Catholic Schools, a band program that serves 25 Catholic and Lutheran schools in Omaha. She has been with that program since its beginning in 1979. 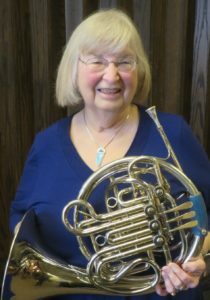 Deb plays tenor saxophone and has been a member of NWS since 1982. Brian and Deb have three amazing adult children who enjoy playing music and have all performed with NWS. Rebecca is a Lutheran pastor, married to Rich, also a pastor, with two wonderful children of their own, Erin and Grace. She plays the piano and trumpet. Andrew is a software engineer in Oslo Norway. He plays trombone in the Oslo Symphony, a community orchestra. Andy also plays guitar. Joshua is a luthier (maker of stringed instruments) and works in Omaha as an instrument repairman. He plays bass guitar for several local bands. Josh also plays tuba with the Lord of Love Brass. Brian joined the Wind Symphony in 1981. He has been on the board of directors at least three different times, serving as president twice. Brian has been a champion for several initiatives, including Small Ensemble concerts, themed concerts, and establishing the NWS Hall of Fame. He manages/edits the NWS web site and provides general IT services for the communication and collaboration tools used by the NWS Board of Directors. Brian has been a playing member of the NWS Swingtones, an 18-piece big band that plays the music of Glenn Miller, Woody Herman, the Dorsey brothers, etc. since its inception in 1983. He took on the leadership position of the Swingtones from founder Mark Foster in 2001.